First of all, thanks for asking! Keep the questions coming. To recap our conversation, I shared that older, existing buildings were greener than new construction because they were built with local, renewable materials; they were built buy local tradesmen with a higher degree of craftsmanship than seen in most buildings today; they were designed for thermal comfort with porches, double-hung windows, high-ceiling, and other means; homes and the business district were compactly developed, with walkability in mind, which allowed exercise and increased opportunity for more social interaction. In terms of airtightness, older building were always a bit leaky. Remember older homes did not have air-conditioning until at least the mid-1950's. Also, many of our more modern sealants, gaskets, and smart air barriers had not even been dreamed up. It has taken us this long to realize that a holistic "whole building approach" was necessary for energy efficiency retrofits. Today we have to re-think everything from the inside out. Believe it or not, “looseness and tightness” are quasi-technical terms used in many architectural systems textbooks like “Mechanical and Electrical Systems for Buildings”. I still refer to my ancient 9th Edition of this tome from college days. Mary’s intuition was right. One of the largest causes of energy lossers in older, existing buildings is infiltration. 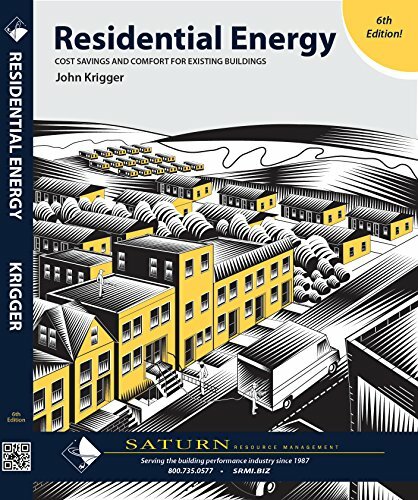 It can increase space-conditioning costs from 5% to 40%, according John Krigger in his book “Residential Energy: Cost Savings and Comfort for Existing Buildings”. Sealing up building air leaks is a primary key for improve existing building energy efficiency. In today’s high-performance buildings, airtightness is often a major goal for architects, engineers, and building energy experts. Historic property owners often have the most to gain from basic weatherization. In my opinion, the older the property the more basic weatherization can help reduce your energy expense. This common idea has been hotly debated in past decades. If you agree to this, you are saying that it is okay to provide fresh-air ventilation by way of unintended air-leakage. Modern building science rejects this notion, as it causes moisture and air-quality issues, among others. Before every building came standard with an heating, ventilation and air-conditioning (HVAC) system, one might argue that the leaks and gaps in the exterior envelope were necessary. The loose construction allowed fresh air to be pulled inside while Grandma cooked Sunday dinner on her old stove. Like us, fire needs oxygen to exist, and as such, we both smother when exposed in too much Carbon Dioxide (CO2). The problem with using unintended air leakage for ventilation, is that it cannot be controlled. During cold or windy weather, too much air might enter the building. Then, when it's warmer and less windy, not enough air may enter. This can result in poor indoor air quality. The cracks we can see on the inner surface offer little insight into how much indirect leakage occurs in an exterior wall, roof or floor. Wind blowing against your home may cause opposing pressures around the exterior. Wind can be driven past the siding and into the wall, to emerge through an electric receptacle on an outside wall, around a sink drain, etc. Conversely, turning on an bathroom vent fan or cooktop exhaust fan can create enough negative pressure inside to pull in surrounding, outside air. An improperly balanced HVAC system can be pulling air in or out of the building too. Do you really want to breathe the dank air from your crawlspace that migrates up through floor boards, or air that gets sucked under the bottom plate of the house, through old carpeting, or walls full of allergens? In early days relatively few homes had any insulation, or vapor/air management layers, but building materials were of high quality with little harmful chemicals. Today things have reversed. The average home includes building materials that are lower quality, less renewable, and include many toxic chemicals in their production. Controlling air leakage is even more critical since the advent of insulation. The more insulation in the envelope, the more critical it is to ensure airtight construction. This is why one of the key Passive House Principles is airtight construction. Air leakage containing moisture (humidity), can more easily reach a dew-point within the wall system loaded with insulation. At the dew point, water condenses on a cooler surface, often inside the wall, causing moisture and mold to form. In a 2012 Austin Energy program evaluation by GDS Associates, Infiltration Reduction was the #2 most commonly implemented weatherization measure in the Austin Weatherization Assistance Program (WAP) customer homes. For this service, the program's average expense was $400 per customer, and reduced overall infiltration by 58%. This means less drafts, better air quality, and lower utility bills. Not bad for free! Many utility providers and state governments offer weatherization incentives such as this one. Since these types of services are often free, they offer the best return on investment (ROI) you can get for your home. The best place to find out what is available in your area is through Database of State Incentives for Renewables & Efficiency®. Even though my home state has a disappointingly low set of incentives, I have capitalized on several during the last few years' home updates. The weatherization assistance, rebates, and tax credits are especially nice. The energy bills in my My Mother-in-Law’s 1905 home decreased by at least 50% each month after weatherization was performed. This included air-sealing and adding attic insulation. Quite remarkable that this home had never been insulated until then! Just think of all the lost energy! If your area does not have weatherization incentives, or you do not qualify, I would encourage you to get some estimates for similar services. You can even do much of the work yourself! In truth, every single home has some hidden energy efficiency to find.The US Department of Energy has a tidy list of the top places to look for leaks in your home. When is the best time of year to perform weatherization? I personally prefer mid-spring through mid-fall. Additionally, for attic work, I am not a fan of summertime heat. We did not touch on Insulation - the other major part of weatherization. Although, it may have the largest net effect on comfort and energy efficiency, I plan to save this for a later post. Have you ever done a major weatherization retrofit for an older home or commercial building? I would love to hear your stories on improved comfort and decreased energy bills.